Rick Avila pilots the zebra-striped #42 modified. The zebra-striped ribbon represents the type of cancer Rick is battling. The North State Modified Series (NSMS), presented by Protect the Harvest, is dedicating its 2018 racing season to cancer awareness and research. The 2018 “Driving Out Cancer Tour”was inspired by NSMS competitor Rick Avila, 55, of Pleasanton, CA. Avila first noticed abdominal symptoms of a Neuroendocrine Tumor (NET) at the age of 42. He dismissed and ignored the pain for 11 years before going back to the doctor. Three days later he was rushed to surgery to remove tumors in his small intestine. Avila still has many Stage 4 cancer NETs in his liver which are not surgically removable. 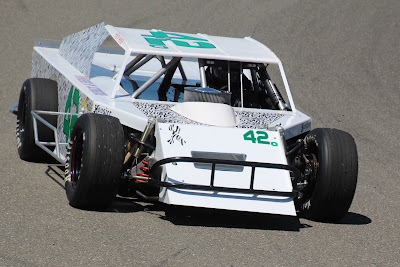 Avila is racing his zebra-striped #42o modified at each race and is spreading the word about how important it is to get checked if you think anything is physically wrong. Avila's fellow racers and families have been handing out “Driving Out Cancer” decals to race fans, and the donations have been very generous. Already over $1200 has been collected for cancer research and awareness in only two outings. Both 3-time NSMS champion Darrin Knight of Kelseyville, and Dustin DeRosier of Cloverdale, have already pledged to donate 10% of their winnings to the cause. Other large donors include Redwood Acres Raceway promoter Blair Aiken, NSMS points leader Randy Houston, NSMS track official Paul Clark, Mike Anderson of Anderson Logging, and Lucas Oil Dash for Cash winner Ian Elliott. The “Driving Out Cancer” campaign will continue at the next NSMS modified race at Madera Speedway on June 9. 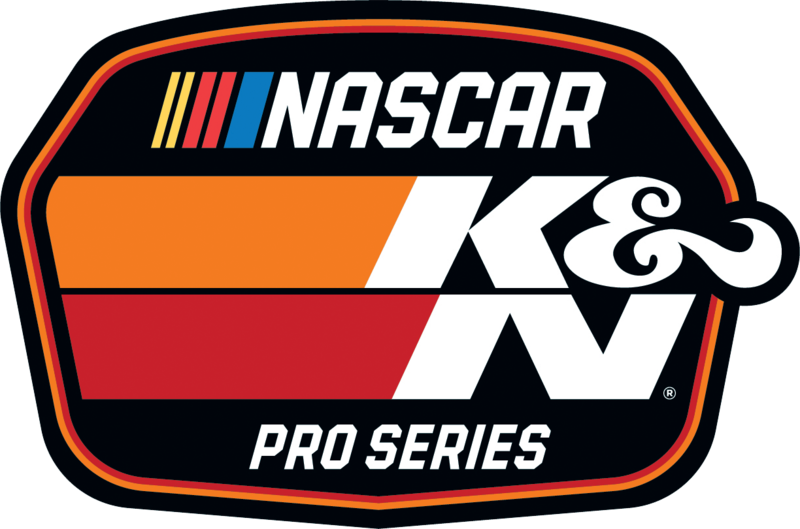 DAYTONA BEACH, Fla. (May 30, 2018) –- The NASCAR K&N Pro Series West race at Spokane County Raceway has been cancelled and will not be replaced on the schedule. The race was scheduled for Sunday July 15. With the removal of the race, the West Series schedule will now be 14 points event for the championship. 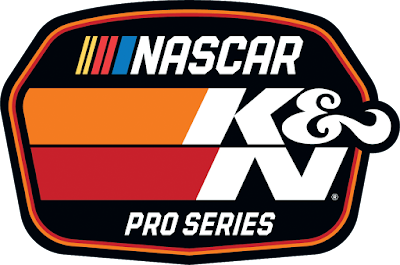 The next race will be the West Series' annual race Saturday, June 9 for the NAPA Auto Parts 150 at Colorado National Speedway. Eureka, CA (May 29, 2018) – It was O’Reilly Night at the Races this past weekend at Redwood Acres Raceway. It was a special Sunday show for Memorial Day weekend which featured five of RAR’s local divisions as well as the North State Modified Series who were making their first of three visits to the track. Kadence Mace was fast time for the Bandoleros with a 22.375. Aiden Kimberling was the trophy dash winner while Trey Daniels took the heat race. The 15-lap main event was dominated by Daniels. He jumped to the lead on lap one and never looked back. Daniels took the victory ahead of Kimberling and Mace. The Compass Community Credit Union roadrunners were paced by Nick Ford in qualifying as his time was 20.449. Tim Ratzlaff got the lead right from the drop of the green flag of the first main event. Ratzlaff dominated, so much so that he broke the 21-second barrier on lap 12. This moved Patrick Sproul to the point and it looked as though the race fell into his hands. Ratzlaff had other plans as he charged hard to regain the lead. With two laps remaining, Ratzlaff retook the lead and was able to pull away. At the finish it was Ratzlaff, Sproul, Ford, Landon Newell and Ronny Crump. Ratzlaff took the lead at the start of the second feature event. Sproul took over on lap two and had a race-long battle with Nick Ford for the win. As the finish came closer, Sproul led with three laps remaining. The next lap, Ratzlaff who had stayed closely behind the two leaders made a move for the lead. The maneuver paid off as he was able to take the lead. Ratzlaff crossed the line first sweeping both feature events. Ford, Sproul, Newell and Crump rounded out the top five. Derek Copeland was quick time in the NorthCoast Lighting and Electric Legends division with a 17.873. Copeland followed up with wins in the trophy dash. Heat race wins went to Kylie Daniels and Copeland. The lap one leader was Tyler Peach and he held on to the lead for five laps before Copeland took over. The most serious challenger to Copeland’s lead was Chris Lawrence. Just as Lawrence made an inside move for the lead, the yellow flag dropped. Copeland led the field to the restart and was able to go on unchallenged. At the finish it was Copeland winning over Lawrence, Peach, Katina Baker and Daniels. In the Fortuna Wheel & Brake bombers, Wyatt Roach was fast time with an 18.331. Roach was the winner of the trophy dash and Jim Redd won the heat race. Redd moved to the lead on lap one. Roach proved to be Redd’s closest competition but fell out early. Redd was able to pull away from the field and lead the race flag-to-flag to win. Chris Naughton placed second, Doug Way third, Kolby Jackson fourth while Roach was scored fifth. Brett Murrell set the fastest time in qualifying for the Humboldt Hydroponics mini stocks with a 18.769. Eugene Palmer was the dash winner while the heats went to Trevor Eacret and Murrell. Jordan Paiment led the first five laps of the feature event before Murrell took over the lead. Palmer moved to second the same lap and tried his best to stick to Murrell’s bumper. Murrell was able to gap Palmer enough that it appeared as though he was going to cruise to the victory. With one lap remaining, Murrell’s car failed moving Palmer to the lead. The last lap proved to be the only lap Palmer needed to lead as he won his first main event of 2018. 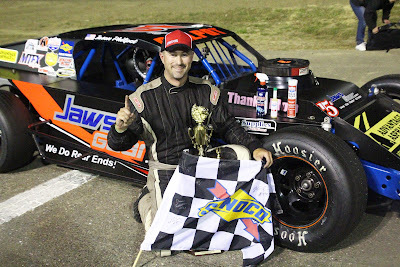 Scott Taylor took second over Eacret, Gary Klientobe and Brian Murrell, Sr.
Randy Houston’s 16.514 in qualifying was the standard set in qualifying for the North State Modifieds. Ian Elliott took the victory in the six-lap Lucas Oil Dash For Cash. Eric Johnson led from the drop of the green flag of the 60-lap event. Jason Philpot followed into second and the first two ran-nose-to tail for several laps. Just past the halfway point, Philpot was able to maneuver past Johnson for the lead. The best battle on the track proved to be for second as Johnson did all he could to hold off Kris Price and Houston. Even after a couple of caution flags, Philpot was able to pull away while Johnson had his hands full with Houston and Price filling his mirror. Philpot was able to cruise to the checkered flag by over two seconds. Johnson held on for second over Price, Houston and Dustin DeRosier. May 27, 2018.....Eureka, CA.... After chasing leader Eric Johnson for 34 laps, Jason Philpot of Sacramento took advantage of lapped traffic to slip under Johnson and stay out front the remainder of the 60 lapper to win race #2 of the North State Modified Series, presented by Protect the Harvest, at Redwood Acres Raceway Sunday night. Philpot's win earned him $1000 plus a $250 bonus from Ward Land Management and Development (WLM&D.) This was Philpot's first win at the Redwood Acres Raceway. Johnson held off the late-race challenges of Kris Price to collect $700 (plus a $150 bonus from WLM&D) for his second place finish. NSMS points leader Randy Houston clocked in fastest at 16.514 seconds over 2nd fast qualifier Darrin Sullivan (16.583), Kris Price (16.628), Eric Price Jr. (16.642) and Herman Pulyer (16.674.) Houston drew an 8 chip for the invert placing Johnson and Dustin DeRosier in row one for the start. Philpot and Pulyer were in row two, the Price brothers Eric and Kris shared row three, and Sullivan and Houston started seventh and eighth. Johnson forged ahead at the start with Philpot diving under DeRosier for second. DeRosier settled into third with Eric Price fourth and Sullivan fifth. As the field was putting down laps, Houston started a forward run passing Pulyer on lap four. Houston continued, nosing under Sullivan for fifth on lap 16, and while Sullivan rode high, Kris Price also drove by. Terry Deal was next to join the front runners, and at the half-way mark it was Johnson, Philpot, DeRosier, Eric Price, Houston, Kris Price, Deal, Sullivan, Ian Elliott, Rich Cobb, Pulyer, Stuart Campbell and Rick Avila. As the leaders approached slower traffic, Johnson chose the high side and it was all Philpot needed to dive low and assume the lead on lap 35. Ten rounds later Eric Price spun in turn two to bring out the first yellow flag. An uneven restart caused an accordion effect that saw the back of the field stack up causing severe damage to Eric Price's car, ending his run. Stuart and Avila were also involved and both retired to the pits. When racing resumed Houston passed DeRosier for third with Kris Price following to assume fourth place. Houston was working hard on Johnson, and with only 10 laps to go Price nosed under Houston for third. Price then set his sights on Johnson, but Johnson never faltered. Philpot led the field to the Sunoco checkered flag followed by Johnson, Kris Price, Houston, DeRosier, Deal, Sullivan, Cobb, Pulyer and Elliott. Eliott was the $100 winner in the Lucas Oil Dash for Cash where he later donated the money to the North State Modified Series “Driving Out Cancer” awareness fund. Eric Johnson collected $50 for his second place finish. Houston earned the Keyser Hard Charger award for passing the most cars, Stuart won the Naake Shocks certificate, and the Frank's Radios awards went to Philpot, Johnson and Kris Price. Scribner Plastics jugs were presented to Elliott and Johnson. North State Modified Series travels south to Madera Speedway for Race #3 on June 9. WLM&D TIME TRIALS: Randy Houston (16.514), Darrin Sullivan (16.583) Kris Price (16.628), Eric Price Jr. (16.642), Herman Pulyer (16.674), Jason Philpot (16.716), Dustin DeRosier (16.799), Eric Johnson (16.857), Terry Deal (16.892), Rich Cobb (16.996), Ian Elliott (17.013), Stuart Campbell (17.140), Rick Avila (17.253). LUCAS OIL DASH FOR CASH: Ian Elliott, Eric Johnson, Stuart Campbell, Terry Deal, Rich Cobb, Rick Avila. MADERA, CALIFORNIA (May 26, 2018) – Bakersfield’s Racin Vernon avenged his round three misfortune to take a dominating win in Saturday’s Military Tribute Night at Madera Speedway, leading all 80 laps for the $2,000 victory. Vernon has led a total of 138 laps over the last two races in the challenging RPM Mortgage Pro Late Model Series on MAVTV. Vernon led 58 laps in the April’s round #3 before spinning from the lead. Blaine Rocha took advantage to take the victory and parlayed that into fast-time in this weekend’s round four. The 33 car turnout was narrowed to 22 starters after a 25 lap B Main. Rick Thompson won the $500 non-qualifiers portion of the B Main. Rocha started from the pole on a straight-up start but immediately yielded the lead position to Vernon. Two-time series champion Buddy Shepherd immediately slowed from the second row with a broken third link and retired to the pits. A pair of cautions slowed racing on laps eight and nine and brought on the new Texas style restarts with Vernon by himself while Rocha was outside of third running Austin Herzog on each attempt. 2016 champion Matt Erickson and Glen Cook staged a long and sustained side-by-side race for fourth behind them. The caution flew again on lap 14 when Garland Tyler stalled in turn two after possibly tagging the front stretch wall. Logan Zampa jumped outside Cook to take fifth on the restart with Kyle Gottula following suit for sixth. Rocha started to peek inside Vernon for the lead before a caution on lap 22. Erickson got swallowed up by both Gottula and Zampa on the following green flag run. The race’s next caution did not fall until lap 48 when Vernon tangled with lapped car Nick Grossi. Grossi spun and in the ensuing melee Cook drove hard into the front end of Zampa while Erickson suffered heavy front end damage as well. The caution ended up bringing the field to the lap 50 break two laps early, with only Grossi ruled as an involved car. Cook’s race was over, however, with heavy damage while Erickson pitted in the infield for repairs to surrender his track position and restart at the rear. Zampa and Vernon were able to continue on unscathed. After adjustments and MAVTV interviews, racing resumed with Vernon, Rocha, and Herzog maintaining the top-three positions throughout cautions on lap 61 and 72. Zampa and Gottula moved past Herzog and staged a spirited race for third that ended with them tangling into turn one. Gottula spun forcing Ryan Philpott to come to a stop. Round #3 podium finisher Jack Wood slammed into the back of the parked Philpott to end both of their races. Gottula’s race was over as well with a broken rear panhard bar, while Zampa was penalized to the back of the pack. A five lap shootout saw Vernon successfully hold off Rocha and Herzog for the win. B Main winner Ross Strmiska came from 17th to finish fourth ahead of 19th starting Dillon Tucker in fifth. A straight up start in the 70 lap 51FIFTY Energy Drink Junior Late Model Series race proved to the benefit of 2017 champion Jesse Love as he took a convincing victory. Love led the entire 70 lap affair after a sizzling 15.117 second lap in qualifying for a new track record. His drive towards his eighth win in just his 12th Jr. Late Model start began from the pole. Love led comfortably ahead of second in points Tanner Reif of Las Vegas and 2018 two-time winner Dylan Zampa. The 11 car field for drivers ages 10-16 raced under green for 37 consecutive laps. The caution finally came out when Reif spun into the turn four wall after apparent contact with lapped car Calvin Hegje. The caution ended up being the impetus for the lap 40 break, two laps early like in the Pro Late Model division. Smooth sailing continued out of the break with Love continuing his impressive performance. Zampa drove up to his rear bumper a few times but never was close enough to capitalize. Love coasted to a 1.6 second victory over Zampa and 10 year-old Tyler Reif. Kayla Eshleman drove from seventh to finish fourth, while Austin Edwards nipped Kabe McClenny for fifth by a nose at the finish. Mini Cups vs. Bandoleros had their largest car count of 2018 with 13 entries in the pits. The race is a two-races-in-one event with two separate trophies awarded. Two-time Bandolero winner Kercie Jung of Bakersfield led the opening lap before Seth Wise led the second lap. Jung then wrestled the lead back which she held until lap ten. Wise led lap 11 before Jung spun on lap 12 for the race’s first yellow flag. 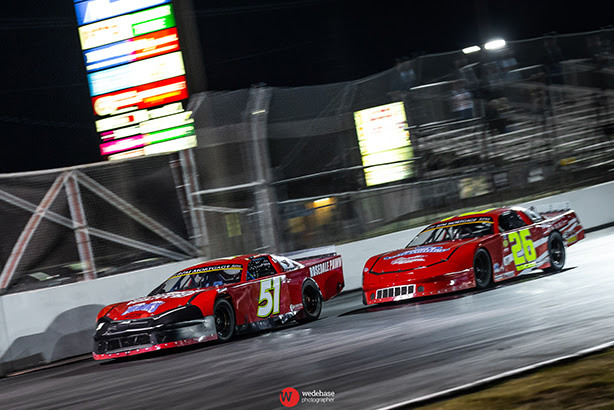 The yellow flag tightened up the race for the Mini Cup victory as well, as three-time winner Kale McClenny had contact with Aaron Thomas that saw McClenny’s entire front bodywork come off. Thomas was charged to the rear of the field for his involvement in the incident. Jung quickly drove back through the field up to second behind Wise, while third running Riley Massey spun in turn four. Massey, winner of the third race, turned her car back around and continued but lost a lap in the process. Seth Wise took the Bandolero checkered flag and the overall win over Kercie Jung and Hank Hall, while Jayce McArthey won the Mini Cup trophy narrowly over Thomas and McClenny. Modified Super Toyotas had five different leaders and five lead changes in their eight car, 25 lap event. John McCollum, Jr. led lap one before spinning out from the lead on lap two. Dave Lander led laps two through four before Bert Stephens held court. Stephens led the race to lap 16 before getting tagged by Ryan Reynolds into turn one to send him spinning. Both restarted at the back. Patrick Geiger assumed the lead which he held for only one lap before it was Lander back out front. Geiger managed to close back down on Lander, taking the top position on lap 20 and leading to the finish. Reynolds and Stephens drove back to the front to finish second and third respectively. A full inversion for the Toyota Sedans did not deter 2016 champion Jillaun Holden. Kurt Davison led lap one before rookie Greg Tyler took over. Meanwhile Holden and Tim Curtis were cutting through the pack one-by-one. Holden finally passed Tyler on the outside for the lead on lap 19 and took the 25 lap win while Curtis was second ahead of Tyler. Racing continues at Madera Speedway on June 9th with the Lucas Oil Summertime Horsepower Nationals presented by Protect the Harvest & Hoosier Tires! Lucas Oil Modifieds in the Protect the Harvest 75 on MAVTV, North State Modifieds, USAC HPD Midgets, Legends of Kearney Bowl, and CSS 360 Super Modifieds make up this big open wheel show.